The absurdly deaf, absent-minded inventor of genius was here to stay, if only because his money allowed Captain Haddock to purchase Marlinspike Hall, his ancestral home, at the end of adventure. In the French version of the Tintin adventures, Destination moon (page 8), the spies gives him a nickname: The mammoth. It is not an innocent allusion! They compare his intelligence to the colossal size of the animal. The Professor's first name in French is Tryphon, and was based on a carpenter whom Hergé knew. His French surname, Tournesol, means sunflower. The combination of the two names sums up the Professor's character, as does the English version, Cuthbert Calculus. Both his appearance and his manner are an anachronism, and there is a subtle contrast between his behaviour and his highly advanced inventions. We know nothing about his family except that he does not have a sister, which we learn in Tintin and the Picaros. Calculus is very absent-minded, hard of hearing, intuitive and very sentimental. He is capable of the most unexpected, and sometimes really weird,connections with reality, by simply using his pendulum. First and foremost he is a fine handyman, then a clever inventor. Calculus is intrigued by everything, including botany, physics, electronics and dowsing. He has all the traits of a scientist who is determined to make his ideas work. Self-assurance, and obstinacy verging on irritability. Calculus's deafness is a frequent source of humour, as he repeats what he thinks he has heard, usually in the most unlikely words possible: "attachez votre ceinture" is repeated as "une tache de peinture?" He does not admit to being almost deaf and insists his hearing is only impaired in one ear. 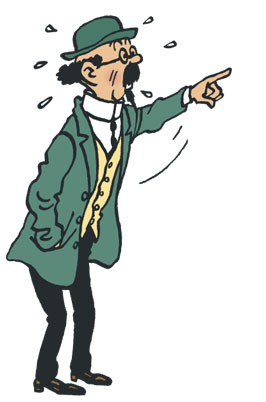 Calculus' deafness was also modelled on a real person, the lawyer Paul Eydt, who was Hergé's colleague at the newspaper Le Petit Vingtième and a source of jokes amongst the editorial team. As well as being the scientist in the adventures, Calculus is also a rather poetic figure. A dreamer and secretly sentimental, the Professor brings an element of freshness and fantasy to the series. It was only in 1944 with the publication of Red Rackham's Treasure that his place in the Adventures of Tintin was assured. He offered his shark submarine to help in the search for Red Rackham's treasure. His career makes a leap forward. Other inventions of his, apart from the submarine, include his nuclear-powered rocket, a new device for putting bubbles into soda water, a clothes-brushing machine, a collapsible wall-bed, motorized roller-skates and color television. In The Calculus Affair he makes a potentially dangerous breakthrough in the use of ultrasonic sound. He has also some ability as a chemist (antidote to formula Fourteen, pill against alcoholism). He is an outstanding scientist and a physicist. As already mentioned he has also some ability as a chemist. He has all the self-assurance and stubbornness of the scientist determined to see his idea through. In the late adventures, Calculus is keen on thinking on inventions less dangerous for human being such as the rose "Bianca". Like other inventors, he is worried about the military use of his inventions. Another interest of the Professor is dowsing or divining, for which he carries a pendulum. The pendulum can be seen dangling out of Calculus's pocket in the hotel scene at the start of Tintin in Tibet and he puts it to use once more in The Castafiore Emerald and Flight 714 for Sydney. Pour créer Tournesol, Hergé avait un modèle très précis en tête : Auguste Piccard, un éminent savant suisse, titulaire d'une chaire à l'Université libre de Bruxelles et familier de la capitale belge. Il se souvenait avoir aperçu sa silhouette longiligne dans les rues bruxelloises dans les années 1930. - The pocket submarine in the form of shark - Red Rackham's Treasure. - The model rocket X-FLR6 - Destination moon. - The nuclear - powered moon rocket - Explorers of the moon. - The ultrasonic instrument of The Calculus Affair. - The pill which makes alcohol distasteful - Tintin and the Picaros. - The motorized roller-skates The red sea sharks. - The spacesuit Explorers of the moon - The land of black gold. - The spacetank Explorers of the moon. - A collapsible wall-bed Red Rackham's Treasure. - The antidote to Dr. Muller's Formula Fourteen. The model rocket X-FLR6 of " Destination moon "
La fusée lunaire dans " On a marché sur la Lune "
The pill which makes alcohol distasteful of " Tintin and the Picaros "
The nuclear powered moon rocket of " Explorers of the moon "
La machine à brosser dans " Le Trésor de Rackham le Rouge "
The motorized roller-skates of " The red sea sharks "
The spacesuit of " Explorers of the moon "
A collapsible wall-bed of " Red Rackham's Treasure "
- La machine à brosser dans Le Trésor de Rackham le Rouge. - The motorized roller-skates of The red sea sharks. - The antidote to Dr. Muller's Formula Fourteen of Land of Black Gold. - The spacesuit of Explorers of the moon. - A collapsible wall-bed of Red Rackham's Treasure. - The spacetank of Explorers of the moon. Yeah of course. He is deaf, and me too. Silence, he did not hear from what they said, I hope he will wear a hearing aids. This why Archibald Haddock keeping screaming at him so loud! THUNDERING TYPHOON!!!!!!!!!!!!!!!!!! aaaawwww!!!! love professor calculus (but i hate his name in english it reminds me of math i preffer tournesol) he is my FAVOURITE CHARACTER!! !